All of our pieces are made to order and are shipped 2-3 business days from the date of purchase. Each piece is packaged individually in a gift box. 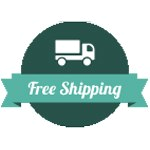 Contintental United States - All orders are handled and shipped FREE via USPS first class mail. If USPS Priority 1-2 day shipping is desired, this option is available during checkout for a flat $5.00 fee.